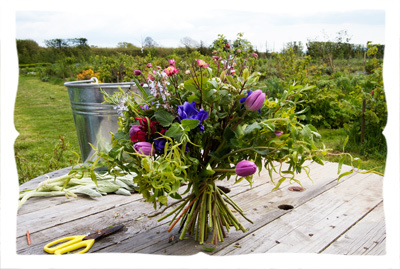 Would you like to learn to hand-tie a bouquet? I spent a beautiful day studying floristry at the Blooming Green flower farm, and made a little movie for you to see how it’s done. 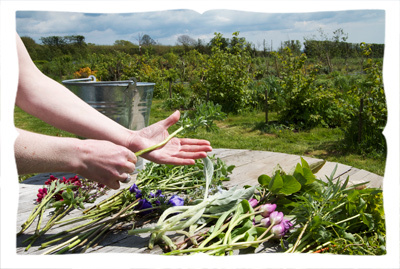 Jen showed us some very simple directions to follow, to stunning effect, using gorgeous flowers and extraordinary greenery, freshly picked on the farm. 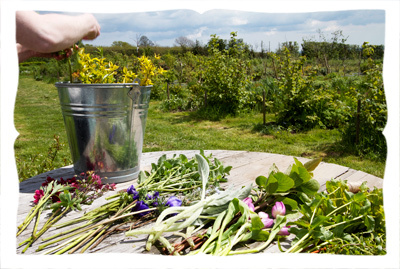 After cutting your plants and standing them in a bucket of water for a good soak, begin by conditioning the flowers. 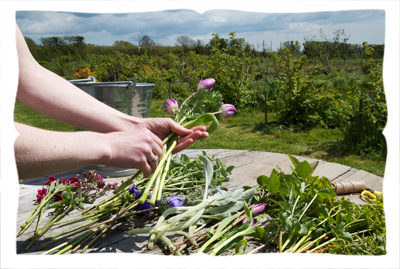 Simply strip the lower leaves off the flowers to keep them from decomposing in the water. Wear gloves if you like. Lay out your flowers and greens and have a sense of how many you have of each. Odd numbers are often the most pleasing to the eye. Begin with a fluffy, well-structured bit of greenery, to support the flowers that will surround it. Fennel is quite wonderful. Lay your first blossom at an angle to the green. If you have three blossoms to add, turn the bouquet a third, add another at the same angle, turn another third, and add the last blossom. Have a look at the movie to get a sense of how Jen turns the bouquet and adds more flowers. Continue to work in this way, choosing greens and flowers and paying attention to multiples, so if you have five lengths of weeping willow, turn the bouquet in fifths, always adding at that same angle to creating a tight, spiralling structure to the stems. 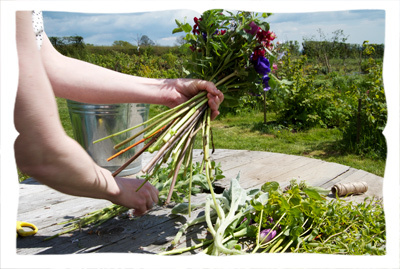 Now and then turn the bouquet to have a look from the top to see if you’ve got a rounding, arching shape to the bouquet – though if there are longer sprigs that naturally want to spray up and out, Jen likes to let those have their way, too. The tie Jen uses is quite wonderful. 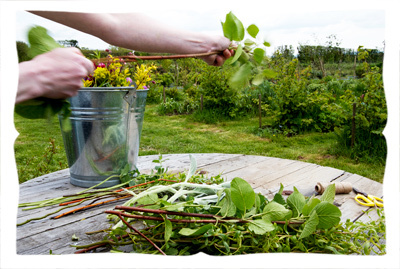 Simply fold a length of twine in half, loop it round your thumb as you hold the stems in place. Wrap the two ends around the stems and back to the loop, and slip them through it. Then you can pull the ends in opposite directions, wrapping as many times as you like around and tying a firm bow when they meet. I’ve forgotten the name of this tie, it’s charming! 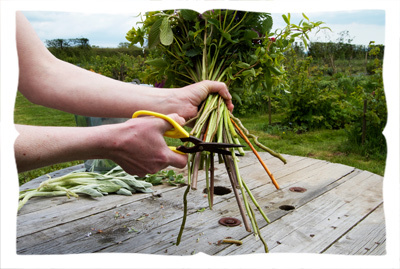 Snip the stems cleanly at the end, leaving enough length to support the flowers. A well-made hand-tied bouquet will have enough structure to stand alone! Let me know if you have a go. I’m so pleased to have had a lesson in hand-tying, such a satisfying thing to be able to do yourself. Thanks Jen! 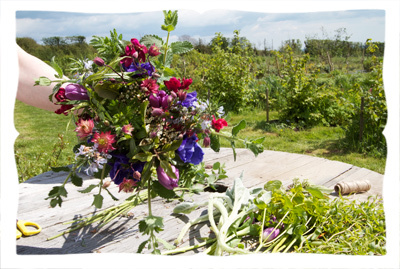 If you’re in England and looking for ecologically, locally grown flowers to buy online, or better yet, you’d like to pick your own for an event, visit Blooming Green in Kent. They are such a delight. If you like studying traditional skills this way, have a look at the old school movies. They come with beautiful patterns, guides and materials, available in the appleturnovershop. Not so far from our little cottage is a flower farm. We drove across Kentish countryside full of bluebells and blossoming orchards, to visit the land where Blooming Green grow row upon row of gorgeous flowers. We’ve something very special happening this week, and we wanted to pick flowers ourselves, ones that are in season, local, and grown with as much care as the organic food we eat. One day I shall grow my own cutting garden, inspired by this gorgeous bit of England. 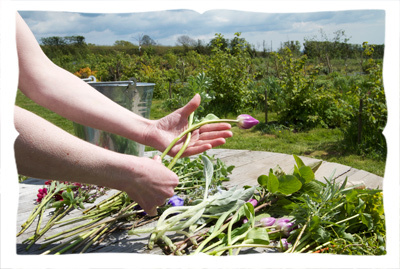 If you have something special you’d like to pick your own flowers for, do visit Blooming Green Flowers, they are so wonderful. Thank you ever so much, Jen & Bek!